Here's just a small sampling of the appearances and areas of expertise from our team. Did you know? Ninety-seven percent of millennials think their generation will finally achieve equality of opportunity for emerging female leaders, according to ManpowerGroup. This is the first generation of men to recognize — as a majority — that a glass ceiling exists. Within the next decade, male millennials will represent the majority of men in the workplace. Yet Harvard research shows these men don’t see it as their responsibility to solve the problem. How do we move men from bystanders to allies? 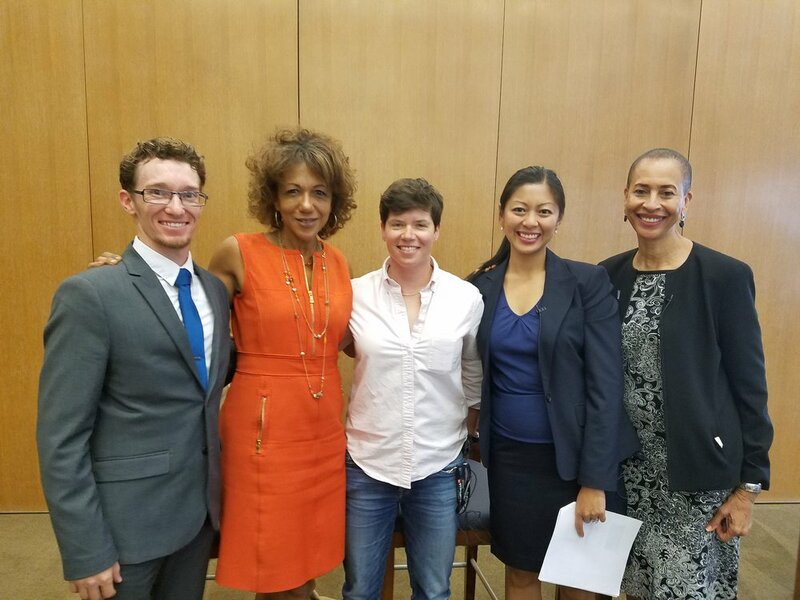 Stanford Medical and Gender Studies Institute Faculty and Staff attended a talk at the Lika Shing Center for Learning and Knowledge. Dale Thomas Vaughn spoke for the second year in a row at the WITI summit in Silicon Valley. Dale recently spoke on the main stage at the WITI Summit about Gender Equality in Large Organizations, How To Be a Behavioral Change Agent in the Workplace, and The Next Generation of Gender Partnership. See the video below. Diversity and inclusion are two of the most prominent topics in corporate human resources nowadays. HR executives from around the country are in Austin this week discussing those hot-button issues and more at a conference hosted by the Society for Human Resource Management. More than 700 people were registered for the Oct. 25-27 event at the JW Marriott Austin, according to an organization spokeswoman. One of the conference's speakers, Dale Thomas Vaughn, is scheduled to deliver a speech Thursday titled "Male Millennials: Allies or Obstacles in Gender Equality?" Vaughn is an international speaker, author and co-founder of the Gender Leadership Group. He answered some of my questions by email recently about some of the most pressing issues in HR. Is there validity to the point in the Journal article that diversity training led by white men can help other white men grasp those concepts? So much of power is being in the room. Often it’s the work of powerful white men who stand up and speak up to their peers about inclusion. Most men want to be on the “right side” of equality but they don’t recognize the ways they can unconsciously hinder or help. With a room of peers, we can actually have the tough conversations without shame or blame, and it empowers men to accept their responsibility in equality. Men can leverage their privilege to open doors for others. At the risk of spoiling your presentation, do male millennials help or harm diversity and inclusion training? We are at a pivotal moment in history. Millennials are the first native gender-neutral generation. The men with privilege have the most leverage to guarantee gender equality and they are also the biggest potential impediment if they are not engaged. The HeForShe Champions for Change Celebration was held at the beautiful WeWork office space in San Francisco on April 14th. Five incredible men were honored as changemakers in the gender equality sphere. It’s not often that you see men standing up for the empowerment of women. Denying traditional masculinity in favor of gender equality is uncomfortable for many people, particularly men and boys who have been raised with the typical “Man up!” or “Boys don’t cry” sentiments that promote physical strength and emotional distance as the epitome of manhood. The men who were honored noted that one of the biggest challenges they’ve faced is overcoming other men’s discomfort in accepting that uplifting women and promoting equal rights does not mean they are weak or feminine. Even if it did, the fact that “weak” and “feminine” are terms so interconnected– that being a woman is inherently bad– is the problem our society is facing. Other honorees included Brian O’Connor of Futures Without Violence, Ray Arata of the Gender Leadership Group, Casey Bates, Deputy District Attorney of Alameda County, and David Batstone, Founder of Not For Sale. More about this story here. You may think men are obsessed with Star Wars because of the epic battle scenes. But in truth, we guys still dream of meeting a little green Yoda who can bring out our full potential, like making spaceships move with our minds. Joking aside, January is national mentorship month. Much of the media focus is understandably on helping at-risk youth make better life decisions, along with an important conversation on empowering women to climb the career ladder. But we wonder, what about life mentors for men? There are very few university courses that focus on how to be a good husband or father, how to balance work and family life, or how to approach mid-life crises without quitting our jobs to travel the world. And few of us have the benefit of being in a book club where more than literary wisdom is exchanged. “Every single man deals with self-doubt at some point in his life,” says Dale Thomas Vaughn, president of the Global Center for Healthy Masculinities in California. In a recent conversation he told us, “this fear keeps us stagnant and isolated” unless we find someone who believes in us and motivates us to move forward. “Even the toughest guys I know are relieved to have someone safe to go to for advice and a pep talk,” adds Vaughn. Ray’s book asks how do you find freedom from outmoded and destructive patterns of behavior that keep you from achieving success in your roles as partner, father, husband, leader, and friend? Most men aren’t aware that the old model of masculinity is outdated and ineffective in today’s culture. Wake Up, Man Up, Step Up: Transforming Your Wake-Up Call Into Emotional Health and Happiness provides an insightful and practical seven-step Roadmap for how you can transform life crises into opportunities for better relationships, happiness, and success. · Rise above any challenging life transition. · Rewrite your future as an emotionally healthy and contributing man. · Become the man you aspire to be. · Serve as a positive role model for the next generation of men. Figure Out What You Want to Do With Your Life Right Now... Make a Concrete Plan and Then Go Do It! Ask yourself these two simple questions: What would you like to do with your life? Is your current process for achieving your dreams actually working? Right this moment - TODAY - is the best moment you could pick to begin your big breakthrough year and to start your new Good Life Plan. "Three Generations of Gender-Conscious Men"
The Global Women's Leadership Summit brings together the women's leadership community - globally recognised women (and men) who are truly pioneering progress and understand what it takes to break through the barriers to growth. In this interview with Chip Adams, Dr. Ed Gurowitz discusses unconscious bias, sexism, and how to affect a company's bottom line with gender partnership. Dale Thomas Vaughn speaks about the crisis of masculinity, the 3 ways great men think alike and the one big barrier to greatness that all men must face. Dale Thomas Vaughn speaks about the International Conference of Masculinities in New York City. Click here to watch entire Video Interview. The first International Conference on Masculinities convenes in New York with the aim to engage men and boys for gender equality. We are joined by conference participants to discuss what masculinity looks like today and what's next for the movement. Actions + goals = authentic power. What is healthy masculinity? On this show we talk a lot about what isn’t healthy, behavior like the alpha male syndrome or the opposite: acting like a doormat. But what does it mean be a healthy male? According to our guest for episode 352 it means being a good guy with an authentic purpose, and also helping other good guys do good things. Dale Thomas Vaughn would know, he runs the Global Center for Healthy Masculinities and is the editor of leadership at The Good Men Project. Today we discuss healthy masculinity and its partner in crime, goal-setting. Listen in to hear how these are related, and so much more on episode 352 of The Art of Charm. The shininess of the new calendar will wane once we get closer to February… and all of those feelings of positive momentum can wear off as well if you’re not still motivated this time next month. Most people don’t even write down their resolutions anywhere meaningful, so looking back on 12 months in late December always feels hollow. In my experience with coaching professionals on goal-setting, the best way to shift your habits is to set out consecutive 6-8 week projects that feel motivating. Basically at the beginning and end of each quarter, you’ll set project goals and then measure them respectively.